It’s a verb as a sound effect! I use them when I’m not sure what else to put. Like “hop.” 😀 Thanks! A lot of webcomics use onomatopoeia for sound effects. I think lurch describes the boat getting under way from being buried in the ground quite aptly. Also, I just wanted to say that I love the art in the third panel! Absolutely gorgeous! Haha! Awesome! I’m glad it fits your screen so well! Hopefully that second wallpaper will be up soon. Thanks! It's been such a pleasure watching this comic develop. I'm liking the ATB (All-Terrain Boat), and the chalky texture on the sound effects. Thank YOU for everything. <333 Also "ATB" is awesome. I like dem trees dem trees. WEEEEEEEEEEEEEEEEEEEEEEEE! Let’s go to the top of the hill and do it again! Sarah, I think you’re being a little hard on yourself about the pace of the comic. 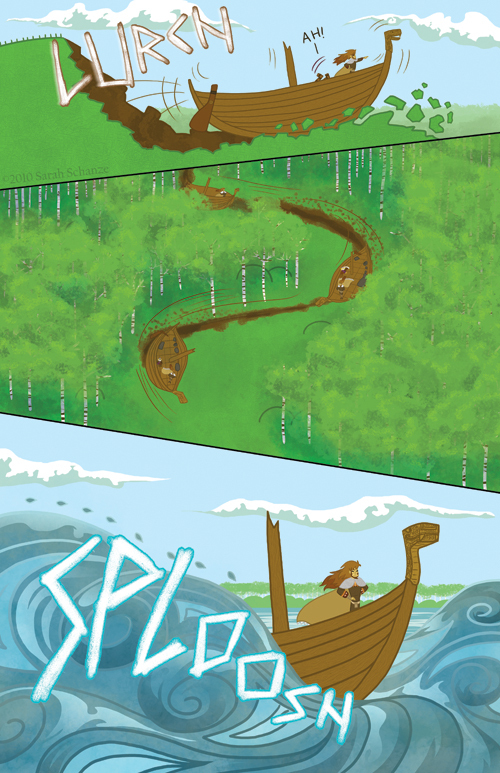 You’re doing a great interpretation of Viking mythology, with beautiful artwork. I think you’ve got a right to feel proud of yourself! Awww, thank you! I do feel proud, I just wish I could do more! At least I haven’t missed a single update so far! >D That’s something. Thanks again! Man, you could keep drawing environments for years and I’d never get tired. I am so glad that you have reached the 1 year mark. Here’s hoping you can keep goning for many more to come. Another excellent comic I was following, Heritage, has kind of gone defunct because of RL complications for the author/artist. Awww thank you! I hope I can keeping going for many more years too. However I don’t blame other artists who have to stop comicking because of real life stuff. I’m very fortunate to have a steady job that allows me enough free time to manage a comic, but not everyone is. Sometimes life throws them lemons and never lemonade, which can wear down anyone, or they work so hard to turn those lemons into lemonade that they just can do much more than that. I’m a very lucky person, and I hope that any artist who’s pulled from something they love so much is able to return unscathed. Loki: Coal! Grab my beard.